After posting the APA visual guide, somebody shared with us this excellent website called Formatically which we have already included in one of our lists in the past. For those of you not familiar with Formatically, this is a very easy to use platform that helps students and teachers format their essays and papers in MLA format. The process is simple and easy. 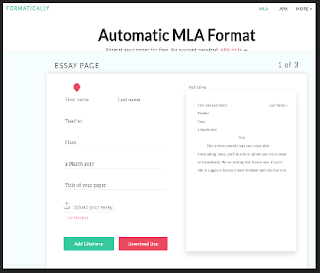 Formatively provides you with an MLA format template where you will add your data and follow directions to generate a properly MLA formatted paper. There is also an automatic formatting tool for APA style which is still in beta phase. It enables users to format their papers in APA style the same way they would do with MLA above. Besides MLA and APA formatting features, Formatically features other interesting sources to help students with their academic writing. These include 'written formatting guides, essay writing help, and a few short videos.’ As a Fremium tool, Formatically has a basic version with limited features and pro version with more features.